Maddix Park | Lorenzo wins; Rossi fourth. Lorenzo wins an incredible race to lift his fifth world title with Marquez and Pedrosa on the podium and Rossi fourth after an amazing ride. Movistar Yamaha’s Jorge Lorenzo led from flag to flag to become the 2015 MotoGP™ World Champion in one of the most dramatic races of the year at the Gran Premio Motul de la Comunitat Valenciana. In the process Lorenzo became only the third rider in the premier class to overturn a points deficit in the last round to become champion and the first since Giacomo Agostini in 1966 to win the final race of the season to clinch the title. His teammate and title rival Valentino Rossi, who started from 25th on the grid after Cal Crutchlow was forced to start from the back of the grid, rode one of the races of his life to cross the line in fourth, but despite his best efforts, the ‘Doctor’ could do nothing to stop Lorenzo becoming champion in the end. Lorenzo eventually took the race win by just 0.263s from Repsol Honda’s Marc Marquez, with his teammate Dani Pedrosa in third after thrilling finish that could have seen a very different outcome to the title battle. #TheGrandFinale certainly lived up to the hype as 110,000 fans at a sold out Comunitat Valenciana – Ricardo Tormo circuit bore witness to one of the most tense and thrilling conclusions to a MotoGP™ season ever. When the lights went out it was pole man Lorenzo who led into the first corner, a lead he would not relinquish for the duration of the race. Immediately he set off at the front, closely followed by the two Hondas of Marquez and Pedrosa plus Andrea Iannone on the Ducati Team GP15. Rossi enjoyed an amazing start, making up 7 places off the line, and the Italian was up to 16th by after the very first corner. Rossi was a man on a mission and while the four riders at the front started to open up a gap, he carved his way through the field. The ‘Doctor’ was into 15th by the by the end of the first lap and 12th after lap 2. He then passed Stefan Bradl (Aprilia Racing Team Gresini) for 11th on the third lap, before swiftly disposing of wildcard Michele Pirro (Ducati Team) to move into 10th. Still on lap three, Iannone lost the front at turn 12 and crashed out of the race, meaning Rossi was now into ninth and the crowd was going wild as they could not believe what they were seeing. At the front, Lorenzo was riding brilliantly, managing the gap to Marquez at around the 0.4s mark. Pedrosa had started to fall back from his teammate, but the front three had now opened up a 3.5s gap to the fourth placed Andrea Dovizioso (Ducati Team). Rossi continued his charge, and by lap five he was embroiled in a battle for sixth with the Monster Yamaha Tech 3 duo of Bradley Smith and Pol Espargaro along with Danilo Petrucci on the Octo Pramac Racing Ducati. On lap six he overtook Smith for 8th, a lap later Petrucci ran wide and Rossi was up into seventh, but by this point Pol Espargaro had escaped 1.2s further up the road. Rossi set off in hot pursuit. By lap nine he had closed down Pol Espargaro, and there was contact as he passed the Spaniard on lap 10 for sixth, but nothing was going to slow Rossi’s progress. On lap 12 Rossi made his move on Aleix Espargaro on the Team Suzuki Ecstar GSX-RR in to turn 1, but Espargaro fought back, with Rossi having to wait until turn 5 to make it stick. Unbelievably he was now into fifth and a few corners later he took Dovizioso for fourth, but by this point he was 11 seconds behind Pedrosa in third. It would turn out to be as good as it got for Rossi, as he didn’t have the pace to run with the front three as by this point he was lapping 0.3s slower than the men in front of him. Rossi, in fourth, needed Lorenzo to finish third if he was to become champion and only Marquez or Pedrosa could stop Lorenzo winning his fifth World Championship now. At this point Lorenzo was still managing the gap at the front beautifully, and every time Marquez appeared to close him down, he opened up a 0.4s lead once more and the duo were starting to pull away from Pedrosa. It was not over yet though, not by a long way. With 8 laps to go Pedrosa, in third, started to close down his teammate, reducing the gap to the second placed Marquez to under 2 seconds. Suddenly Pedrosa was the fastest rider on track by far. While Marquez put Lorenzo under constant pressure at the front, it was Pedrosa who had the momentum and amazingly with three laps to go, only half a second separated the front three. Rossi was now 18 seconds behind the trio and hoping for a miracle. With two laps to go, Pedrosa made a move on Marquez into second, but Marquez fought back immediately. This swapping of places allowed Lorenzo to open up the tiniest of gaps at the front and as he crossed the line to start the last lap, he had a 0.347s lead over Marquez. The tensions was unbearable, but Lorenzo kept his cool to ride smoothly through the last set of corners and despite Marquez throwing everything at him on the last lap, Lorenzo held on to take the race win by less than three-tenths of a second from Marquez. It was the 28-year-old Mallorcan’s seventh win of the season, 40th in MotoGP™ and 61st of his illustrious career. It was in incredible finish to one of the most epic seasons in the history of the World Championship and it meant that Lorenzo (330pts) had overturned Rossi’s (325pts) seven-point lead to lift the title by a slender five-point margin, in the process lifting his fifth World Championship title (250cc – 2006, 250cc – 2007, MotoGP™ - 2010, MotoGP™ - 2012, MotoGP™-2015). With Marquez taking second and Pedrosa recording his 100th MotoGP™ podium in third, Rossi crossed the line 19 seconds behind Lorenzo in fourth and despite a simply astounding ride, Rossi will have to wait to lift that elusive tenth title. Pol Espargaro was fifth as the leading Satellite rider, 2.8s ahead of his teammate Bradley Smith in sixth, with the British rider securing sixth in the championship standings in the process and the honour of top Satellite rider in 2015. Dovizioso finished in seventh as the leading Ducati, ahead of Aleix Espargaro in eight. LCR Honda’s Cal Crutchlow was forced to start from the back of the grid after experiencing issues with his bike before the race started. The British rider pulled off a great race to ride from 26th through to 9th, with Petrucci completing the top ten. EG 0,0 Marc VDS Scott Redding took the last points scoring spot in 15th, with Avintia Racing’s Hector Barbera in 16th as the leading Open Class rider, with the Spaniard securing the Open title in the process as his rival Loris Baz (Forward Racing) could only finish in 19th. Nicky Hayden (Aspar MotoGP Team) bowed out of the MotoGP™ class by finishing as the leading Open Honda in 17th with Australian Jack Miller (LCR Honda) crossing the line in 21st. There were DNF’s for Broc Parkes, Mike De Meglio and Eugene Laverty. The riders and team return to the Valencia track on Tuesday & Wednesday to kick off the 2016 season with the first official test. Check out the full MotoGP™ race results and the final 2015 MotoGP™ World Championship standings. Valentino Rossi makes an incredible charge through the field for fourth in the Valencia GP. 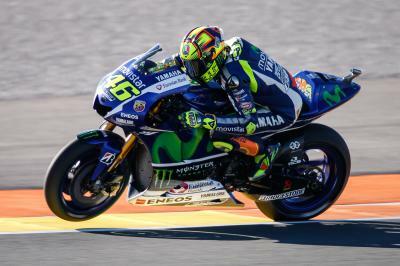 The opening five laps of the Gran Premio Motul de la Comunitat Valenciana were some of the best of Valentino Rossi’s (Movistar Yamaha) career, the experienced Italian cutting through the field. He would eventually end in a respectable fourth place, unfortunately with teammate Jorge Lorenzo taking the victory Rossi was unable to claim his tenth World Title. The 2015 MotoGP™ will always been remembered as one of Rossi’s best, coming back from several tough years and proving that even at 36 years old he’s still a threat.